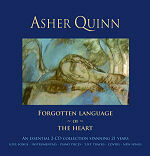 This is a double CD with 37 tracks... a kind of 'Best of Asher Quinn', released in 2009. The album spans the whole of Asher's career, and includes vintage instrumental, piano and vocal tracks. It also includes some 'live' material and a few cover versions as well.